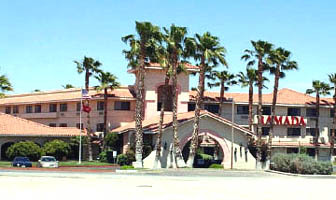 This TO&A Court Reporting Suite at the Holiday Inn Express is conveniently situated about halfway between Las Vegas and Los Angeles, this hotel`s location in Barstow, California is right off I-15, making us an ideal choice for your busy law firm. This suite offers exceptional meeting space for your next deposition. Our well-furnished deposition suites provide state of the art audio/visual technology and our friendly and professional staff is on hand to handle all your needs. TO&A can provide all your deposition needs from court reporters, interpreting, and videography.